Have you ever wondered why so many things are called “Harlem” in Loves Park — Harlem Road, Harlem School District, Harlem Township, just to name a few? The answers lie in the history of this early railroad line. First surveyed in 1835, Harlem Township was named by early settlers from the Dutch settlement of Harlem on Long Island, New York. The had “borrowed” the name from the town of Haarlem in the Netherlands. Harlem Village apparently derived its name from the township. Asa Taylor was one of the village’s first settlers, arriving here in 1836 from Massachusetts after travel by steam/sail boat and ox-cart. According to Craig Campbell, author of History of Loves Park, the original site of the Village of Harlem was at the intersection of Middle and Church roads, today known as Alpine and Harlem roads. There’s some evidence to suggest it began farther north, where Willow Creek crosses Alpine Road near Harlem High School. In 1845, a group of Methodists started meeting in a one-room school until a tornado demolished the roof, marking one of the first big community events. Taylor donated part of his farmland for a cemetery and a church in 1847, but he didn’t live to see it built. He died from injuries in a farm accident that same year, and became the cemetery’s first occupant. The cemetery is still located on the northeast corner of Alpine and Harlem Roads. By the 1850s, the village had a new schoolhouse, a post office operated by the first female postmaster in the area, and a stagecoach stop on the route between Rockford and Janesville. Then came the railroad. 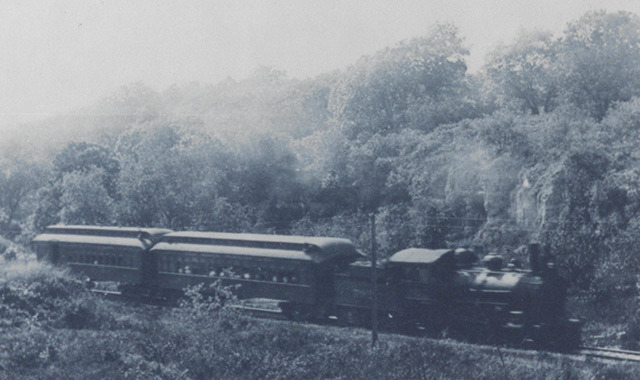 When plans were announced in 1853 to connect Kenosha and Rockford with a rail line through Harlem Township, the townspeople began to move parts of the village from its first site to the northeast corner of Bluff (today’s Forest Hills) and Harlem Roads, to be near the railroad right-of-way. By 1859, the move was complete. In its heyday, up to 10 trains a day stopped at the Harlem Station, bringing mail, freight and passenger service to the growing community. Asa Taylor’s son, Henry Taylor, served as station agent at Harlem for several years, but was killed on the job in October 1870, when he was struck by a moving train while attempting to throw a switch. Lewis Fabrik, Jr. also served as railway agent at Harlem for about 20 years, and managed the grain elevator as well. A train derailed in 1911 as it pulled into the Harlem depot, because heavy rain the night before had washed out the roadbed beneath the tracks. Two people were slightly injured. The Harlem Methodist Church was completed in 1848, and still stands on Harlem Road just east of the cemetery, some distance from Harlem’s second and final location, but is no longer Methodist. By the 1870s, the village contained a school, store/post office, wagon/blacksmith shop, grain elevator, railroad depot, township hall, stockyards and several residences. 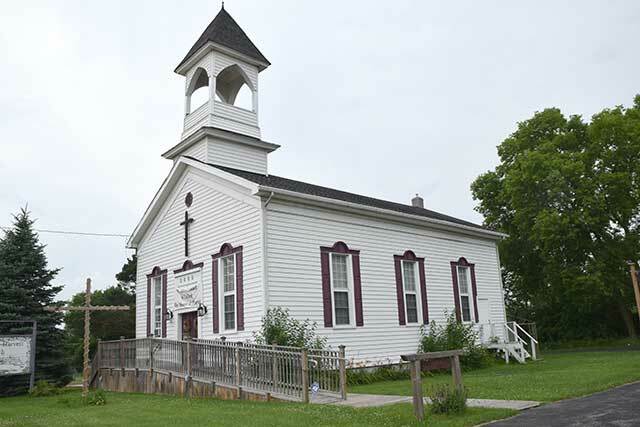 The Township Hall was constructed in 1874 at a cost of $1,095, after some competition from Argyle residents who wanted it built in their village. The building was moved to Midway Village Museum and restored in the 1970s; the roof had to be lowered to clear obstacles during the transfer. 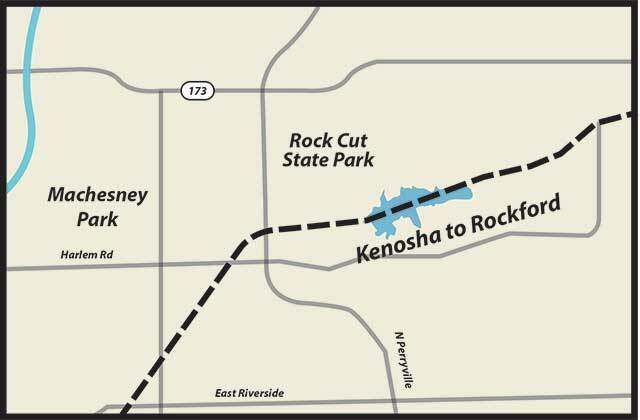 The dotted line on this modern-day map shows where the KD line once ran through what is now Rock Cut State Park. The line began in Kenosha, Wis., entered Illinois near Hebron and ended at a depot on North Madison Street in downtown Rockford that stood near the brewery that is now Prairie Street Brewhouse. In 1853, some Kenosha businessmen wanted to connect their town by rail to the Mississippi at Prairie du Chien by way of Beloit, Wis. The people in Beloit were already committed to a route through Racine, so they didn’t support the Kenosha plan. When it opened in 1861, the Kenosha Division (KD Line) entered northern Illinois near Hebron, then went through Harvard, Chemung, Capron, Poplar Grove, Caledonia, Argyle and Harlem, ending in Rockford just north of the Jefferson Street Bridge. Today’s trolley station at that site closely resembles the original KD depot, and the trolley still runs passengers along the same KD tracks. Constructing the route from Argyle to Harlem along Willow Creek proved to be quite a challenge, since workers had to blast a cut through a bluff of dolomite limestone. The area became known as Rock Cut, eventually lending its name to a forest preserve and later, a state park. The main part of the KD Line was abandoned in 1937, and most of the tracks were removed. Eastern and western portions of the railroad still survive today, and are used for local freight service in Kenosha and Rockford. According to Welte, the spur that went up past Windsor Road became heavily used by industries that had located in that area. In 1955, the Illinois legislature appropriated funds to create a 200-acre lake and recreation area at Rock Cut Forest Preserve. Soon construction began on an earthen dam to back up Willow Creek to form the lake, and in 1961 the lake began to fill. The railroad bed as well as the cut in the limestone is totally submerged today, although some evidence of the roadbed can be found below the dam in the thick vegetation. A small knob still protrudes from the lake surface just east of the dam, indicating where the railroad was. The lake was named in honor of Rockford State Rep. William Pierce, who co-sponsored the legislation that created the lake and Rock Cut State Park. Welte is a member of a group of model railroaders called the Northern Illinois Historical Railroad Association (NIHRA). Since 2004, members have been constructing an HO-scale representation of the KD Line in a room inside the Warren Paulson Agricultural Museum in Argyle, very near the place where the actual railroad ran. The layout contains about 180 feet of track and represents towns and landscapes from Harvard to Rockford, including Harlem Village and Rock Cut. Brian Landis created the model Harlem buildings, including a depot, grain elevator and coal yard. About 8 to 10 active members meet monthly to work on their prototype hobby. The County Superintendent of Schools in Winnebago County in the early 1900s was O.J. Kern. In 1910, after several years of advocating a change, Kern succeeded in convincing the Harlem Township School trustees to consolidate four one-room rural schools into one district. His goal was to give rural children the same quality of education that was then available to students in nearby cities like Rockford. Harlem Consolidated District #122 was the second such consolidation in the county (Seward was the first), and the eighth in the state. The opposition in Harlem in 1910 centered on transportation issues, since the four original schools were within walking distance to students’ rural homes and farms. The solution was for students to use the interurban railway, which had recently been extended between Janesville and Rockford, running parallel to North 2nd Street, right in front of the new school. The Harlem School was a one-story brick building with an exposed basement, constructed on the corner of Harlem Road and North 2nd Street, where Hamilton Center now stands. Rapid population growth created a need for expansion, so a second story was added in 1918. Through the years, as Harlem Village dwindled in importance as a community, Harlem Consolidated School District grew, and today contains six elementary schools, one middle school and a world-class high school. According to Campbell’s book, the Harlem schools played a “key role” in the development of Loves Park, eventually leading to the city’s incorporation in April, 1947, and the dissolution of Harlem Village as an unincorporated entity. Brian Landis is an enthusiastic collector and student of history, especially when it comes to railroads. He co-authored two books in recent years with writer Mike Schafer: Rockford Area Railroads (2010), and Rockford and the Interurban Railways (2015). According to Schafer, Landis’ extensive collection of photographs, documents and artifacts was invaluable in the production of their books. Landis’ enthusiasm for history also includes Harlem Village, as he grew up near its center and attended Harlem schools. For years he has advocated for a monument commemorating the village, by circulating petitions and soliciting support from Rockford Register Star columnist Chuck Sweeney. He served on the Harlem Village Committee that researched, designed and produced the content on the monument that now stands at Harlem and Forest Hills Road, and he is justly proud of the outcome. 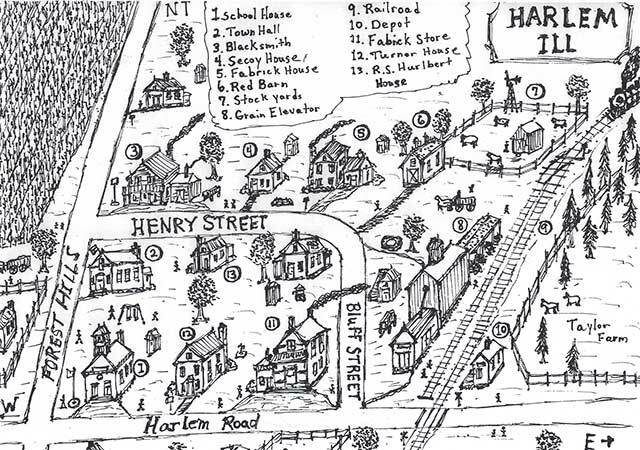 This hand-drawn map by Brian Landis is based on his extensive research about Harlem Village and its one-time inhabitants. Landis also brought to this magazine’s attention the need for a definitive article about Harlem Village and the KD Line, and provided much of the historical documents and photographs used herein. His personal collection also includes a section of KD Line track that once crossed Harlem Road, and was removed in 1993. It now supports a Fairmont Speeder car in Landis’ back yard. The historical marker commemorating the Village of Harlem was dedicated in ceremonies at its location on the northeast corner of Harlem and Forest Hills Road on Nov. 3, 2016. The ceremony marked the culmination of nearly two years of work by a committee of 14 volunteers who met to create a design, content and location for the marker. Woodward Inc. became an early partner in the process, since it now owns most of the land where Harlem Village once stood. Most of the early buildings were demolished in 2013. Woodward eventually offered to finance the entire project, as well as provide a location. The cost of the monument was $11,586, not including the landscaping. Burden’s mother, Violet Burden, served on the committee, as well as his uncle, John C. Nelson, who died before the dedication ceremony. This entry was posted on Thursday, August 24th, 2017 at 11:58 am	and is filed under Features, Top Posts. You can follow any responses to this entry through the RSS 2.0 feed. Both comments and pings are currently closed.